"A brilliant introduction to one of the most widely used programming languages in UK schools, which enables children to bring their ideas to life with almost startling ease... The explanatory text is beautifully clear, with jargon kept for when it's absolutely necessary." Scratch is a programming language that's widely used in schools and universities, and is the perfect first starting point for people of all ages who want to learn to program. It's designed to enable you to be creative in making your own games, animations and other programs, while it shields you from the complexity of many other programming languages. Scratch has recently found a whole new audience on the Raspberry Pi. 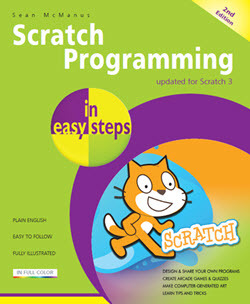 Scratch in Easy Steps will show you how you can use Scratch to build games and other programs. Each chapter includes step by step examples you can build and experiment with, and the book covers the full range of Scratch's capabilities. This book covers the web-based Scratch 2.0 as well as Scratch 1.4, as used on the Raspberry Pi. Take your first steps with Scratch by programming the cat to walk. Learn to use the pen and loops to make geometric patterns. Rainbow Painter enables you to paint on the screen with your mouse. In Spiral Rider, you combine sprites and the pen to make your first game. Can you dodge the beach balls and collect the ice creams? Make sweet music with Cosmic Chorus. Tap keys to conduct the choir. Learn how to use maths and the timer in Quiz Break. Make a sophisticated Hangman game, using lists, sprites and broadcasts. Space Swarm is an arcade game that sees you firing on invading aliens. Going Batty shows you how to use your webcam: shoo the bats away! Another webcam example: steer the beetle to the doughnut! Witch Rider shows you how to interact with a PicoBoard. Keepy Uppy is a short game demonstration you can easily customize. Learn how to use sprites to write on the Stage with this reuseable script. Maze Mania is a short script for playing mazes in Scratch. Photo Safari: click the animals to snap their photos, but be quick! Penguin Patter demonstrates lists and enables you to chat with a penguin. Look both ways! Shop Cat challenges you to cross a busy road. Visit my Scratch 2.0 and Scratch 1.4 Examples Arcade to try out Spiral Rider, Super Dodgeball, Space Swarm, Donut Chaser, Keepy Uppy, Photo Safari, Penguin Patter, Shop Cat, Quiz Break and Hangman. You can play them in your browser without downloading any software. You need a browser that supports Flash and this doesn't work with Internet Explorer (sorry!). 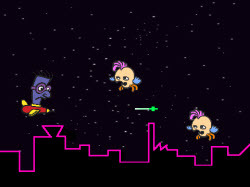 Note that you don't necessarily need Flash to use Scratch itself, just to run these demos. I've added some comments and instructions to these demos too, to give you an idea of how they fit into the book. The book was reviewed in issue 21 of The Magpi. They concluded: "It is written in plain English, is fully illustrated and is printed in full colour. If you are looking to start programming in Scratch then this will surely be a perfect addition to your bookshelf." How to use this book - a short introduction to the book that I took out to make space for one more great project! What's the difference between a variable made for one sprite and a variable made for all sprites in Scratch? I've been making a series of Scratch demos in under 10 blocks that illustrate things you can do in Scratch. They're presented in demo cards you can share with friends on social media, and accompanied by a more detailed explanation to help you understand how to adapt them. I made many of these for my Code Club group, to explain key features of the language.